FLY FROM ANTANANARIVO - ANTSIRANANA - MOUNTAIN D’AMBRE PARK - RED TSINGY - ANKARANA TSINGY PARK - ANKIFY - NOSY BE ISLAND . ANTANANARIVO - ANTSIRANANA BY FLIGHT . Fly from Antananarivo to Diego Suarez and meet our guide and driver at the airport in Diego Suarez, then we will make city tour around Diego Suarez including colonial buildings and 3 bays then take you to the hotel. EXCURSSION TO EMERALD SEA BY MOTOR BOAT THEN TO MOUNTAIN D'AMBRE PARK . Your driver and guide will pick you up from the hotel and take you with your bags to the place where you will start the boat excursion to emerald sea to see gorgeous turquoise waters. This beach is perfect for swimming and snorkeling with its shallow water . we provide you testy sea food during the excursion . After your diving, back to the vehicle and heading to mountain d'ambre park . This trip takes about 1 hour which is located around 30 km south of Diego Suarez . MOUNTAIN D’AMBRE PARK - RED TSINGY - ANKARANA NATIONAL PARK . Today, you’ll have half day for exploring the Amber Mountain National Park. This is one of the most popular hiking parks. Splendid scenery, including lush mountain rainforest, crater lakes and the best view of waterfalls. Amber Mountain is an isolated patch of mountain forest that rises from the surrounding dry region. You will see some lemurs (crowned and Sanford’s); birds (look for Madagascar crested ibis and white throated oxylabes) and various reptiles. After lunch time, heading to ankarana national park. Visit red tsingy on the way. 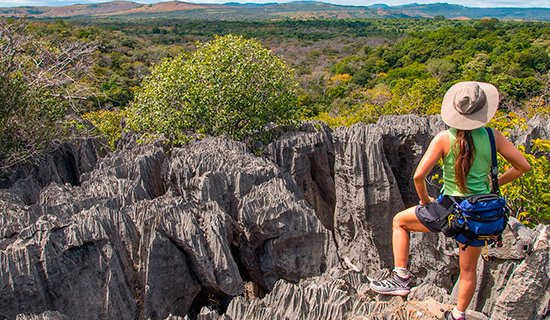 Ankarana is one of Madagascar's most rewarding hiking destinations. The trails lead to awesome viewpoints on ridges above hundreds of limestone needles. TSINGY OF ANKARANA NATIONAL PARK - ANKIFY . Today, you and your personal guide will start your bit trail to discover different species of lemurs and other wildlife including Perrier’s black lemur, northern sportive lemur and dwarf lemurs, ring-tailed mongoose, fossa, tenrecs. This park is home to 100 bird species, 50 reptiles (including some endemic and threatened snakes and geckos) and 10 frogs cohabit in the Park. Inside the spectacular and huge labyrinth of caves 14 bat species. After lunch , drive to ankify where you will take your boat transfer to nosy be the next day. ANKIFY - NOSY BE ISLAND . After your breakfast, we transfer you to the place where you will take motor boat to across to nosy be island . The boat ride takes about 40 minutes. When you come in nosy be island, you will be independent and choose hotels where you want to stay. Note : The main way of leaving Nosy be island is by plane to Tana and you can purchase these local flight tickets through our agency. This tour can be organized in backward too (for example, you come from nosy be and meet our driver in ankify then drive to Diego). TOTAL PRICE FOR NORTH TOUR FOR 5 DAYS . car with driver and fuel during the trip. Food and accommodation for the driver. Bed and breakfast for 4 nights. Parks entrance fees with local guide fees for the clients. Boat ticket from ankify to nosy be. ANTSIRANANA (Diego Suarez) :is the capital of Madagascar's northern most provinces. It has one of the world's most beautiful deep-water harbors, complete with a photogenic sugarloaf mountain. Visitors usually love this city, which is probably the most French city on Madagascar. It has this colonial feel over it. This is the largest city of the north with a huge cozy market, a range of fine restaurants and some fantastic places and national parks to visit nearby. Diego is the perfect place to hang around and prepare for visiting the neighborhood. AMBER MOUNTAIN NATIONAL PARK : is located around 30 km south of Diego Suarez. It was established in 1958 and protects a total surface of 185km². This massif rises from the surrounding dry region forming an isolated stretch of mountain rainforest covering an area of 18.200 hectares and lying at altitudes between 800 and 1.470 metre. The park offers a great biodiversity, a huge tropical forest with endemic fauna and flora, luxuriant vegetation and many waterfalls and volcanic lakes. The climate is perfect, the cool air refreshes after the heat of the lowlands. The dominant ethnic groups are the Sakalava and the Antankarana. This park homes about 25 species of mammals, among them 6 carnivores such as the ring-tailed mongoose and the fossa, and 8 lemurs: Sanford's brown lemur, crowned lemur, lesser bamboo lemur and are five species of nocturnal lemurs. Besides these forests are the home of 75 different bird species (35 of which are endemic and even locally endemic, like the Amber Mountain rock-thrush ), 60 reptiles, such as tiny stump-tailed chameleons, leaf-tailed geckos and snakes, 35 frogs and more than 40 butterflies. The flora is very reach as well. RED TSINGY : These tsingy are made of red laterite (similar to clay) and not of limestone rock like the tsingy at d’ankarana. They are caused by land / mud slides during heavy rain, which is regular in these parts. The effect of burning land that pro voc deforestation and erosion result because of rain season, and becoming imaginary and impressive view of that site are forming the scilicet (sand), late rite (land) and argil . ANKARANA NATIONAL PARK : It was created in 1956 and lies about 90 km south of Antsiranana covering an area of 182, 5 km². It is a spectacularly eroded limestone fortress of sharp ridges, patches of dense tropical jungle, deciduous forest, deep caves and canyons and rushing rivers. With an annual rainfall of almost 2000 mm, the underlying rocks undergo heavy erosion producing amazing karst topography, being it’s most known result the fantastically eroded limestone spires, known as “tsingy”. The Park is in fact one of the most visited specially among hikers. It offers incredible trails, unique and terrific landscapes and a lot of animals! This reserve contains one of the highest densities of primates of any forest in the world. Its dense forests support one of the largest and least disturbed populations of crowned lemurs. Sanford's brown lemur, Perrier’s black lemur, northern sportive lemur and dwarf lemurs, ring-tailed mongoose, fossa, tenrecs and Madagascar striped civet are also a common sight. Almost 100 bird species, 50 reptiles (including some endemic and threatened snakes and geckos) and 10 frogs cohabit in the Park. Inside the spectacular and huge labyrinth of caves 14 bat species, local endemic blind shrimps and the world's only known cave-living crocodiles are waiting for your visit. At night swarms of bats and flying foxes swoop in the darkness. ANKIFY : a small harbor from where you can reach Nosy Be on an half an hour crossing with local speed boat. The coast is beautiful and yet very little known. Ankify is not a village itself, but a jetty and there is therefore no structure, just a few chop-bars and hotels in the vicinity. The boat ride from ankify to nosy be takes about 40 minutes. MADAGASCAR NORTH TOUR FOR 8 DAYS. 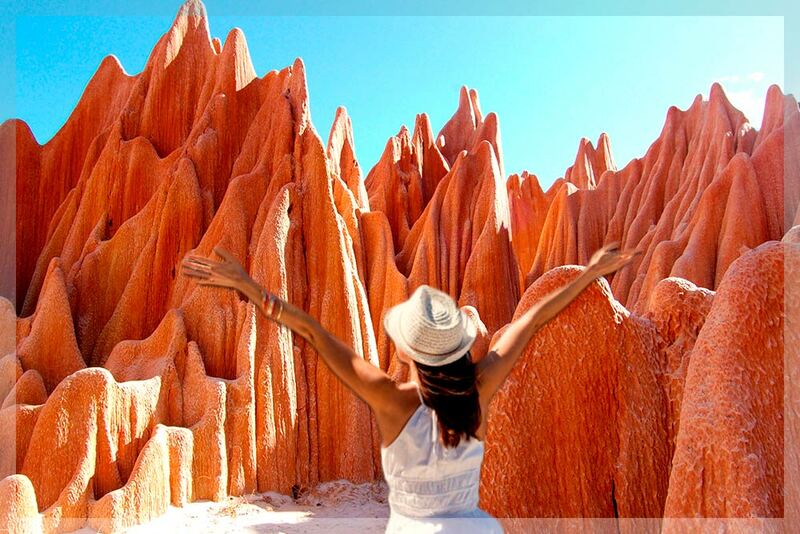 “National parks, guided walk , Tsingy d’ankarana, Red tsingy , Amber mountain , Boat trip , Emerald sea “. ANTANANARIVO – ANKARAFANTSIKA NATIONAL PARK - ANTSOHIHY – AMBILOBE - ANKARANA NATIONAL PARK - RED TSINGY - MOUNTAIN D’AMBRE NATIONAL PARK - EMERAUL SEA – DIEGO .